How to get to Isle Royale National Park! 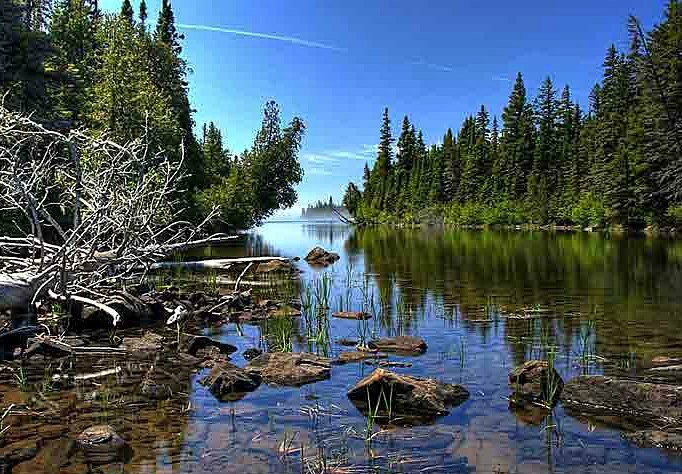 Isle Royale National Park is a remote island wilderness located in the middle of Lake Superior. 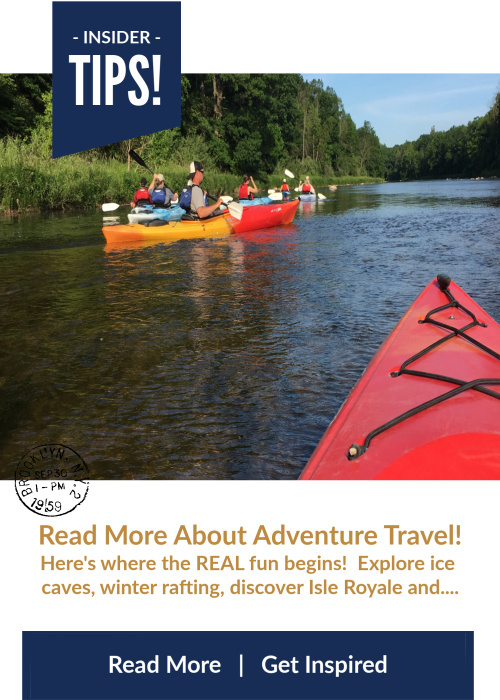 It is only accessible by ferry, seaplane, or private watercraft which is, of course, what you would inspect when embarking on an over-the-top National Park adventure! Isle Royale will definitely not let you down! 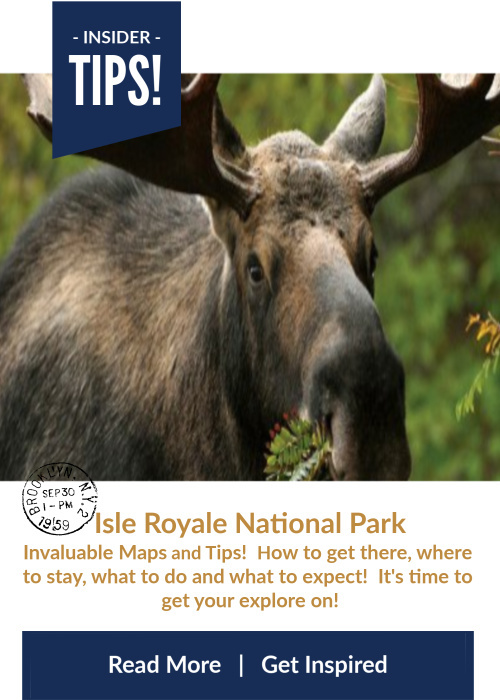 Download an invaluable map of Isle Royale! Isle Royale is a remote island located west of Houghton and Copper Harbor in Michigan. See the red star on the map below. Is Isle Royale Open Year Round? From November 1 - April 15 annually, Isle Royale and its surrounding islands are closed to all visitors. It is best to contact The Isle Royale Houghton Visitor Center at (906) 482-0984 with any questions. They are located at 800 E Lakeshore Dr, Houghton, MI 49931. If you are wondering how to get to Isle Royale National Park, Houghton, Michigan is the main departure point. 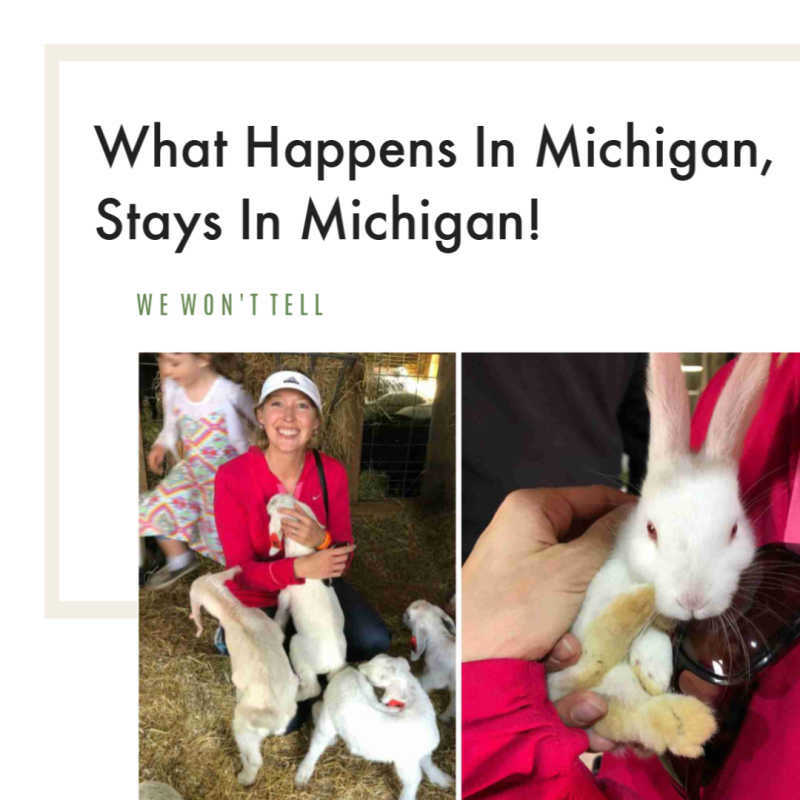 If you are spending the night in the UP prior to embarking on your trip, we recommend staying in Houghton for better, more diverse hotel, restaurant and supplies choices. 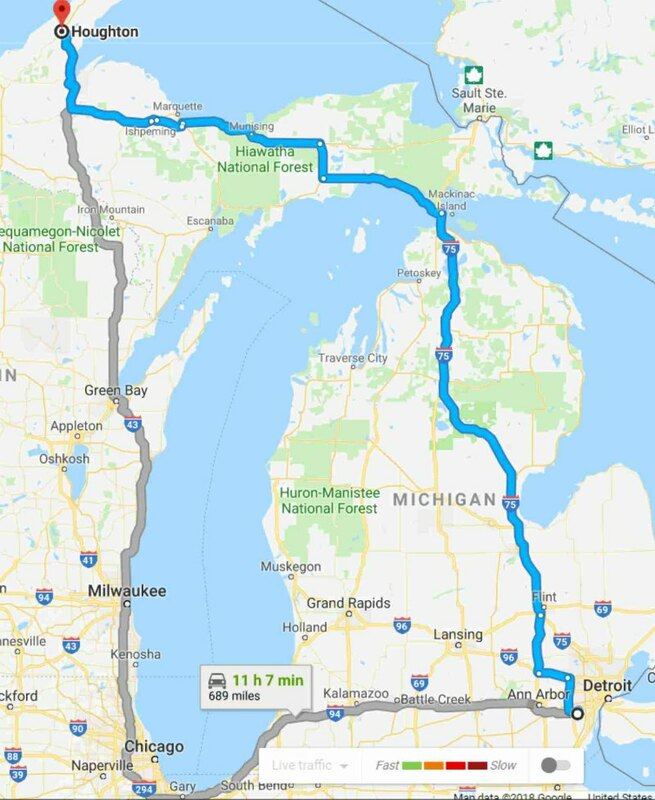 BY CAR: It takes about 9 hours to reach Houghton, Michigan via N I-75 by car from Detroit if you don't stop. 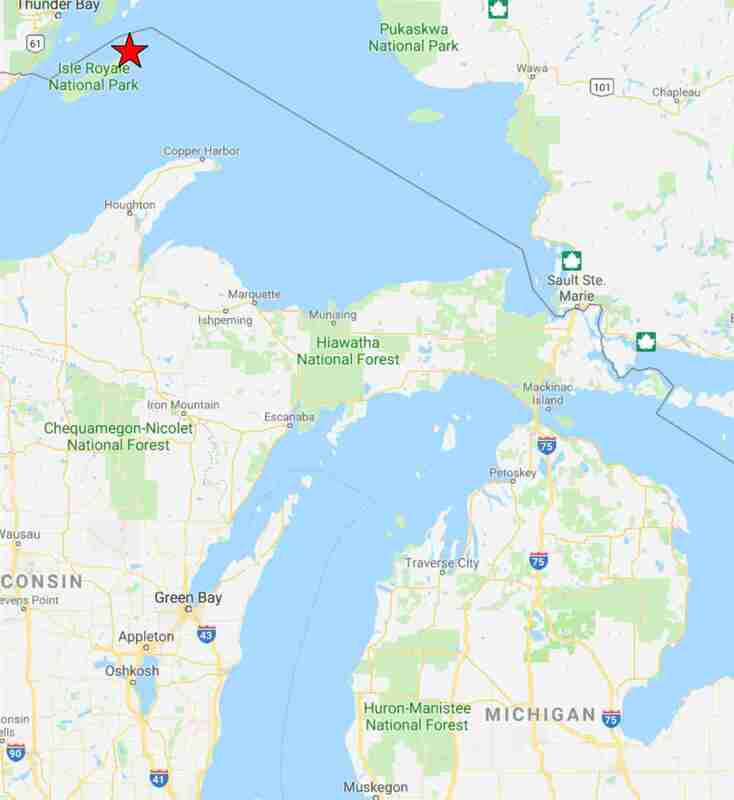 But in reality, allow about 11-12 hours as you will want to stop for lunch, take a break at the Mackinaw Bridge for some photos and stop along the shoreline in the UP to enjoy the magnificent views. There are lots of smoked fish shops, pasties and great restaurants. You don't want to hurry and miss the journey along the way! 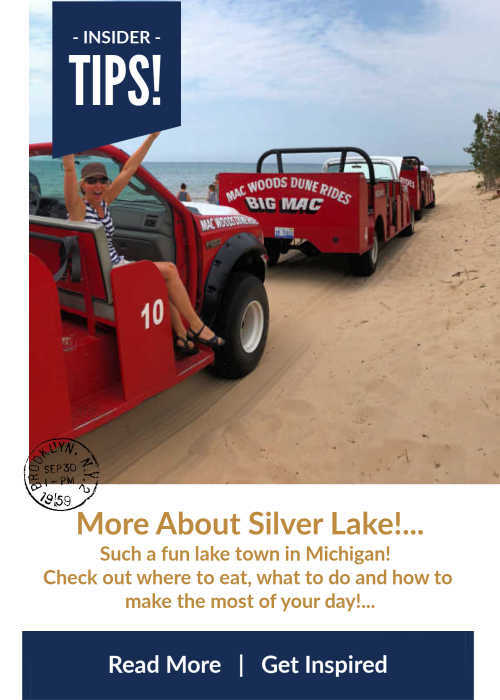 You can also drive around through Chicago and Green Bay, Wisconsin but it will definitely add time to your trip. Plus you will miss the Mackinaw Bridge! BY PLANE: Houghton County Memorial Airport. 23810 Airpark Blvd Suite 113, Calumet, MI 49913. Airport Designation: CMX. Book on Expedia or your favorite booking site. Sawyer International Airport. 125 Ave G, Gwinn, MI 49841, Airport Designation: MQT. It is about 2 hours and 15 minutes to Houghton. But again, allow about 3 hours for any stops. You can rent a vehicle at the airport. Taxi companies run from both Houghton and Calumet to Copper Harbor. Look online for Greg’s and Neil’s Taxi services. Copper Country Limo offers service to and from the Houghton County Airport (CMX) between Houghton and Calumet. Houghton, Michigan. Located off of US-41 at the base of the Keweenaw Peninsula. (Ranger III and Isle Royale Seaplanes). This is the main departure point. The Ranger III is a 165 foot long, 34 feet wide, 648 ton vessel that carries 128 passengers. 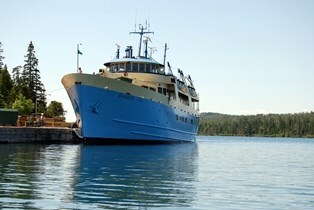 Service departs from Houghton, Michigan or Rock Harbor on Isle Royale. Isle Royale Seaplanes offers seaplane transportation from Houghton, MI and Grand Marais, MN to either Windigo or Rock Harbor on the island. 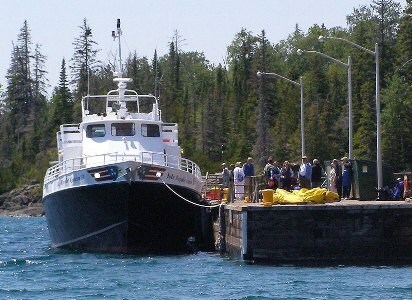 The Isle Royale Queen IV passenger ferry operates between Copper Harbor, Michigan and Rock Harbor on the northeast end of Isle Royale National Park. Plan early on how to get to Isle Royale National Park so your trip is stress free! Ranger III-800 E. Lakeshore Dr., Houghton, Michigan. Services are offered May through early September annually. From Houghton, MI to Rock Harbor on Tuesdays and Fridays. From Rock Harbor to Houghton, MI on Wednesdays and Saturdays. Parking in Houghton is free! You can bring boats up to 20' in length and kayaks for additional fees. It's 73 miles to Rock Harbor and it takes 6 hours! But don't worry, you will be entertained with the scenic views of the Keweenaw Waterway. You will also pass under the world's largest lift bridge! How cool is that! Plus, once on the open water of Lake Superior, you will appreciate the size and breadth of the world's largest fresh water lake! Enjoy the amazing views, shoreline and great photo opportunities of the historic Rock Harbor Lighthouse. If you are wondering how to get to Isle Royale National Park in the cheapest way possible, the Ranger III is your cheapest option by far. Plus there is free parking. Check here for schedules, instructions, reservations, fees and info. See the bottom of the page for Isle Royale daily charges that need to be paid ahead of time. 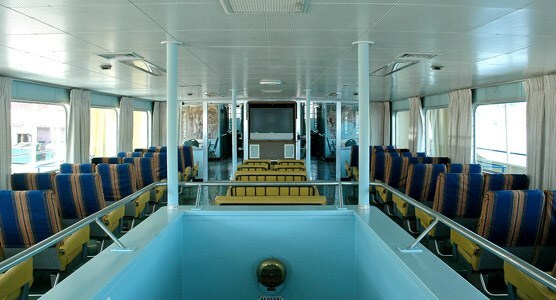 The Ranger III also offers Keweenaw Waterway Cruises! It's a fun 3 hour cruise down the Portage Canal! Cruises take place on select Thursday's in July and August. Please contact the park here for the most up to date cruise information including a phone number and email for inquiries. Queen IV-Throughout the season the ship's schedule varies but it typically operates from early May through the end of September. The Isle Royale Queen IV departs from Copper Harbor, Michigan and takes a little over three hours to arrive at Rock Harbor. The Isle Royale Queen IV makes the departure and return trip on the same day, allowing for both overnight and day-trip passengers. The cost is roughly the same as the Ranger III but takes half the amount of time. There are also daily parking fees for the Queen IV lot. This option is best for those with a short time frame on the island. Click here for the schedule, fees and information. How to get to Isle Royale Nation Park faster? Seriously, how cool is this? If you are wondering how to get to Isle Royale National Park in the most adventurous way possible with amazing photography opportunities, this is it! Hancock Portage Canal, Seaplane Base, 21125 Royce Road, Hancock, MI 49930. 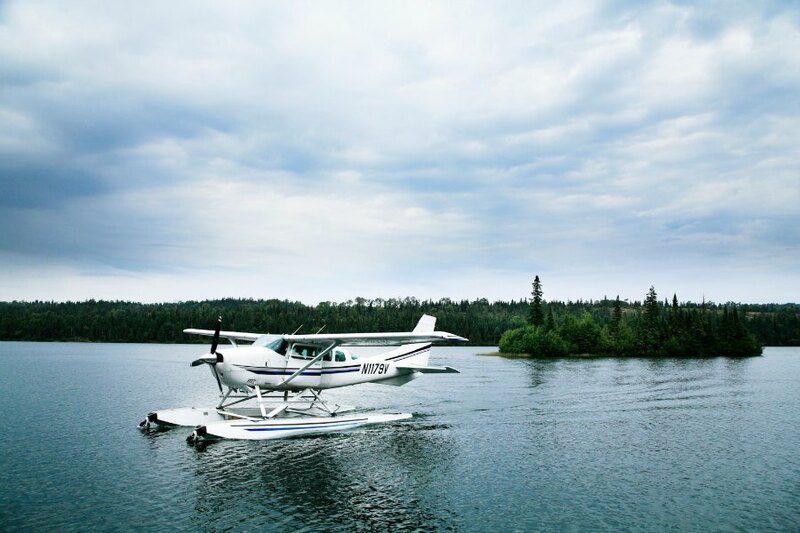 The Isle Royale Seaplane features four passenger seats for for your group. The plane travels approximately 125 mph so you will arrive in Isle Royale in typically less than an hour! Plus the trip itself is super exciting and adventurous! You can purchase one way (try it out!! ), round trip or transportation between Rock Harbor and Windigo. For a true adventure, you gotta try this! Click here for fees, schedules and information. Prior to departing for Isle Royale we recommend staying in Calumet or Houghton. Depending on where you are leaving from it matters where you stay! If leaving from Copper Harbor we suggest staying in Calumet or Copper Harbor. It will save you 20 minutes of driving compared to Houghton. If leaving on the Ranger III or Seaplane we recommend staying in Houghton. We hope this page further informed you on how to get to Isle Royale National Park. 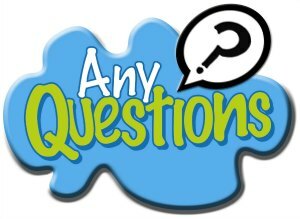 If you have suggestions, tips, funny stories, photos or an itinerary please join the conversation here! Secure your transportation to and from the island sooner rather than later. Transport can sell out any time of year and is especially prone to do so in July and August. 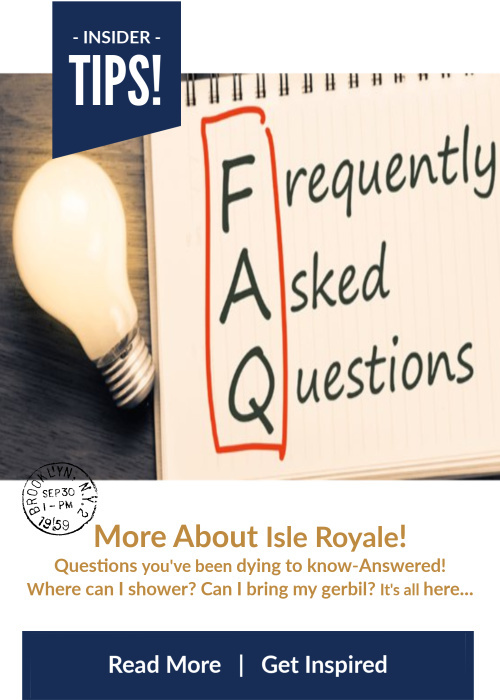 Plan how to get to Royale Isle National Park now so your trip is stress free! ISLE ROYALE USER FEE: The National Park Service levies a user fee for Isle Royale: 2018 fee: $7.00 per day (not per night) per person 16 years and older. You can also purchase an an annual Isle Royale Pass (approximately $60) covering the pass-holder and 3 other people for any length of time. Pay the fee ahead here. Then scroll down to Isle Royale. Thanks for visiting our " How to get to Isle Royale National Park" page! !